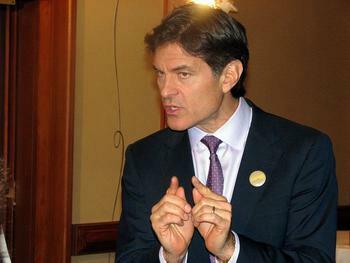 Popular TV host Dr. Oz is no stranger to controversy. His health claims and advice have often been challenged, especially when it advocates one particular thing and suggests avoiding others. Now, Dr. Mehmet Oz is a defendant in a suit brought by the North American Olive Oil Association (NAOOA) over an episode of The Dr. Oz Show that aired back in May. In its complaint, the association claims Dr. Oz and his guest made “false and unsubstantiated claims” that 80% of the extra virgin olive oil on U.S. supermarket shelves is adulterated with less expensive oils and artificial coloring. The association counters that independent testing has verified the integrity of the product. The suit also claims that Dr. Oz presented his guest as an olive oil expert without disclosing that she worked for a California olive oil producer. The association claims in the suit that California producers have “coordinated a national campaign” to spread false information about olive oil originating outside the state. “Dr. Oz has a unique platform to help millions of people make better decisions for their health, but he has carelessly deceived people and furthered a special interest agenda over the well-being of Americans,” Balch charged. The association filed its suit in a state court in Georgia, relying on that state's food libel law. Georgia is one of 13 states to have enacted such legislation, allowing food producers and manufacturers to bring action for alleged defamatory and damaging claims. According to Reuters, attorneys for the host did not respond to an offer to comment, which is fairly standard practice in the case of lawsuits. In 2014, Dr. Oz touted the weight loss benefits of green coffee beans, citing a study that was later discredited by the Federal Trade Commission (FTC). The FTC complaint alleged the study was so hopelessly flawed that no reliable conclusions could be drawn from it. Oz spent a rather uncomfortable afternoon in front of a Senate Committee, as Sen. Claire McCaskill (D-Mo.) sternly took the celebrity doctor to task for his advocacy of products with unproven health claims.